Download pdf concert lead sheets for Familia, Galeria, Beach House, Hurricane Season, Lindsey & Parque Central from my 1st album FAMILIA plus various scores & bass parts from OPEN WINDOW here. Click the button over the image. The lead sheets contain melody, Bass lines and chord changes for each tune. I hope you enjoy playing them with your band. Please feel free to drop me a track or even a video of your band playing them. ENJOY! (Please feel free to CONTACT me with suggestions of any of my charts you would like to see here). 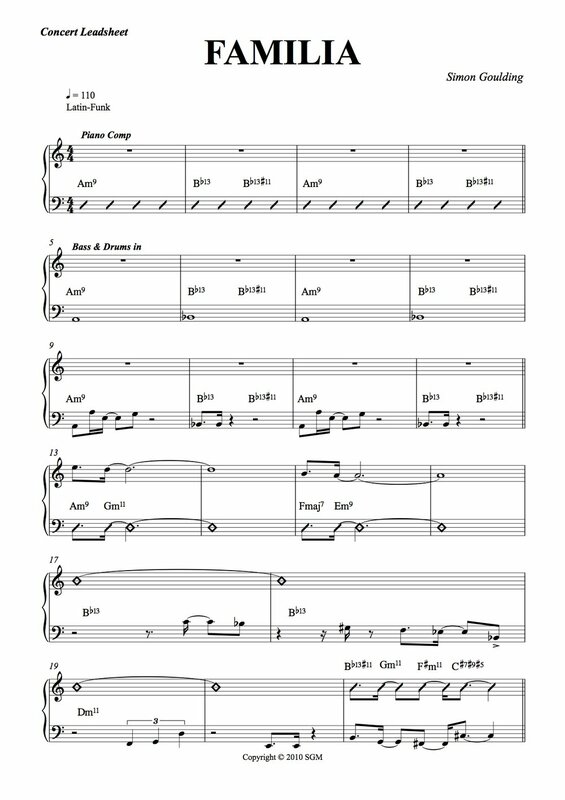 Below you can download an audio track of Familia without bass for play along with the lead sheet. Below you can download an audio track of Open Window without bass for play along with the bass part. Here are a selection of bass lines & adaptations for you to download completely FREE. Here is my bass adaptation of Estudios Secillos by the great Cuban composer/guitarist Leo Brouwer. Click below to download the PDF. One of my favourite bands is Steely Dan. Here is the bass transcription of Chuck Rainey's great bass line from the track Josie from the album Aja (1977). Fantastic, musical bass line, doubled on guitar on the album. Becker & Fagen were going for the "Cop show" sound. There is also a great use of double stops in this line. A very important album to own. Click HERE to buy it. Here is my transcription of Jaco Pastorius' bass solo on Havona. Havona is from the 1977 Weather Report album 'Heavy Weather'. An essential part of developing improvisation is to study and play solos. This is an extremely harmonically sophisticated solo using colour tones, odd phrase lengths and interesting rhythmic ideas. I HIGHLY recommend buying this album if you haven't already. Click HERE for a purchase link.